It’s almost here. Can you feel it? The new installment of Sid Meier’s Civilization – the behemoth of behemoths in the 4X realm – is nearly upon us. Civilization VI will launch in just a few days, October 21, and the hype is everywhere. With three different editions and a preorder bonus (more on those later), a lot of gamers are wondering whether to jump in right now or to hold off and see how things shape up. The info is everywhere, but sorting through it all can be a Herculean task. That’s where we come in! This isn’t a review in any sense; just a quick-and-dirty survival guide for those who want to get a feel for what the game is like ahead of its launch. Bear in mind the usual disclaimer: we haven’t seen the final release version, so things are still liable to change. One of the most noticeable changes in Civ VI is what the developers call “unstacking the city.” Instead of buildings all existing within the single city tile, some buildings (called Districts) now occupy actual tiles on the map outside the city center. For example, rather than just build a library in the city, then a university in the city, etc., players will have to build a campus district on a map tile within the city’s borders. When it’s done, the library can be built in the campus, followed by the university, and so on. Different districts receive adjacency bonuses from various terrain features, and wonders also take up a tile (and block you from working that tile for its resources, as well). Cities are limited in the number of districts they can build, forcing compromise and strategic thinking. Additionally, wonders themselves take up a map tile, preventing that hex from being worked for its yield. These changes all add a level of planning and strategy to city layout that hasn’t existed in previous Civ titles. Who doesn’t love some good Egyptian architecture? Civilization V was a departure from the Civ formula in that it enabled “tall” empires (few large cities) as an alternative to “wide” empires (lots of smaller cities). For better or worse, the sixth installment returns to a “wider is better” approach by removing most of V’s penalties for settling many cities. Spamming infinite cities will probably not be the best approach, and there are a few mechanics in place to slow empire growth. For example, some units and buildings scale up in cost for each one built in an empire. However, the days of tall play are behind us unless the game is seriously revamped to facilitate it. Sometimes the path to progress is long and tortuous, and sometimes you sit in the bathtub and discover the king’s crown is fake. 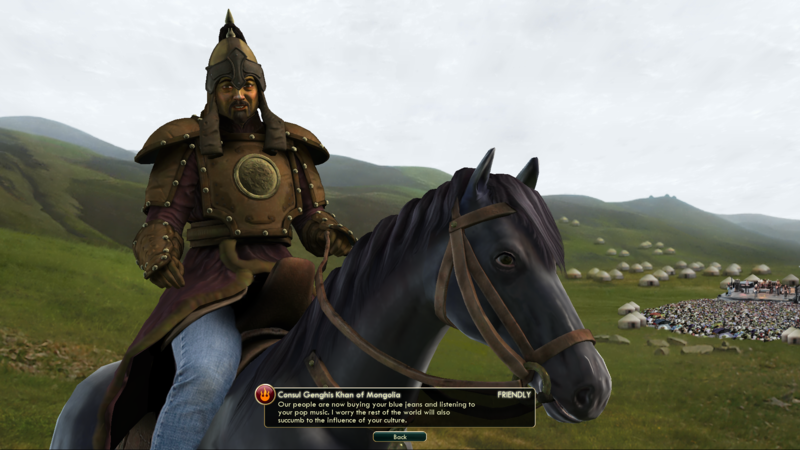 Civ VI reflects this dynamic with the Inspiration mechanic. With a few exceptions in the very early game, every research project has a criterion which, once met, finishes half of the research for free! If you kill a unit with a slinger, your people recognize the need for better ranged weaponry. Boom – you’re halfway to researching Archery. As you can imagine, this can have a huge impact on how a game unfolds, both by influencing how you prioritize research projects and by incentivizing players to chase after inspirations. In a nod to Grand Strategy games, Civ VI introduces casus belli (Latin for “cause for war). As the game progresses, the diplomatic penalty for warmongering increases from nothing in the Ancient Era to truly crippling in later ages. Enabled by specific techs or civics, different casus belli reduce the aggressor’s warmonger penalty, but also impose some restrictions on the circumstances or conduct of the war. Holy Wars can be called against a civilization who has converted one of your cities. Liberation Wars can be called against a civilization that has conquered cities of a friend or ally, but the instigator must return those cities rather than annex them. This will require some extra planning and strategizing from the player, and will also open up the possibility of justified wars (and some… not-so-justified wars like Native Conquest) with a lightened diplomatic penalty. The culture system in Civ VI closely resembles that of Civ V in many ways. Culture is produced by buildings, causing your cities’ borders to grow one hex at a time. Where it departs is that instead of using culture to unlock social policies, there is now a culture “tree.” It functions just like the tech tree, except you make progress using culture instead of science. Put down your pitchforks – the tech tree is still there too! They exist side by side. In place of social policies, Civ VI offers a set of government which come with a set of bonuses and can be further customized with policy “cards.” These policies have smaller bonuses than government types. However, you can slot several policies into your government, and they can be changed around rather freely. In addition, each government has a different number and configuration of policy slots. So Merchant Republics have lots of room for economic policies plus economic bonuses, while Monarchies are heavy on military slots and give a bonus to city-state patronage. City-states have received a huge overhaul. Instead of throwing endless piles of money at them, players now curry city-state favor through envoys. Envoys aren’t units; they’re a resource accrued over time like Great Persons. The more envoys you send to a particular city-state, the more bonuses you receive – extra faith, religion, money, etc. depending on the type of city-state. Additionally, the civilization with the most envoys to any given city-state becomes the suzerain, which means gaining alliance privileges, resources, border access, the ability to take control of their units for a number of turns, and a unique bonus. That’s right! The city-states are no longer just a trait, picture, and jingle – each is now mechanically distinct and unique! Civ VI re-introduces civilizations with multiple leader choices, a feature which skipped a generation after Civ IV. Each leader has a “Leader Unique Ability,” along with their own gameplay style and agenda which influences how they interact with other civs. As of the vanilla release, only one civilization, Greece, will feature multiple leaders: the Athenian statesman Pericles, and the Spartan queen Gorgo. However, a soft-leak points to Isabella as the second Spanish leader alongside Phillip, which means we can expect to see more choices as part of future content packages. While leaders with differing play styles and personalities are a staple of Civ, the sixth iteration expands on that system with leader agendas. These are specific parameters that, if satisfied, please or anger the leader. For example, Queen Victoria, an imperialist expansionist historically, wants to colonize every continent in the game and dislikes civilizations from other continents. This system allows for some emergent gameplay as the diplomatic status shifts in response to the game state. Further, along with their predetermined stated agenda, every leader gets a randomly-assigned hidden agenda in every game. This helps to lend some variety and a little mystery to diplomacy. Much like the new individuality of the city-states, each Great Person now grants unique benefits as well! Whereas before, the name of a GP was just there for show, now each one confers a bonus that reflects something about that individual. The Great Scientist Abu Al-qasim Al-zahrawi – a physician in life – grants extra healing to friendly units, while Isaac Newton gives a bonus to the output of science buildings in your empire. These unique abilities also put civilizations into direct competition over specific GPs, which adds a new layer to the GP game. What’s Staying (Mostly) the Same? Combat: For better or worse, Civ VI pretty much imported the Civ V system of one unit per tile, with all its strengths and weaknesses. However, it does add two mechanics. First, specialist units like Medics or Battering Rams can be stacked on top of traditional combat units like Crossbowmen or Infantrymen. Second, units of the same type can combine into a single Corp (two units) or Army (three units), giving a flat strength boost. Despite these additions, combat looks to be by and large as it was in Civ V.
Victory: Victory conditions have seen few changes. Win conquest by holding every civ’s capital, win science by setting up an extraterrestrial colony (Mars, in this case), win culture by prodigious application of Levi’s and k-pop. However, the Religious Victory returns from Civ IV, this time won by converting a certain percent of the world to the one true faith (yours). Diplomatic victory was pulled from the test builds, as the developers were unhappy with its implementation, but is expected to make a return eventually. Mars: 1. Alpha Centauri: 0. Tech tree: Those dreading (or championing) an avant-garde tech system like Beyond Earth’s tech web can stand down; the traditional tech tree is making a return. Apart from the Inspiration system, anyone who’s played Civilization V (or IV, or… well, any of them) will feel right at home. Cheating AI: The AI in Civilization has never been terribly robust, generally relying on bonuses to production and unit strength to challenge players, and Civ VI seems to be no different. In fairness, it’s too early to predict how challenging the game will be. The press version only shipped with Prince difficulty and is nearing two months old. (AI is usually one of the last elements to be tuned in 4X games.) Still, that the computer players receive bonuses every level above Chieftain level (the second-lowest of eight difficulties) instead of Prince (fourth-lowest) like previous titles does not bode well for the state of the AI. Amazing production values: Let’s be honest here: it just wouldn’t be Civ without top-notch production values! (Well, modern Civ at least). And Firaxis has delivered yet again. A beautiful game board, an exquisite strategic map mode – much improved from V – crisp animations, great leader voiceovers in their mother tongue, Sean Bean’s spectacular narration… The list goes on. Some people have balked at the more cartoony nature of the graphics, but love them or hate them, I think most will agree that the look and feel of Civ is still top-tier. Excellent user interface: Firaxis really stepped up their game when it came to Civ V’s UI, and VI is looking even better! Along with distinctive icons and easy-to-grasp graphical elements, Firaxis has added some great features like map markers and multiple useful lenses. The only place the press version is lacking is in tooltips – hopefully to be implemented for the public launch – and some quality-of-life features such as bringing attention to undeveloped resources. There are still a few questions yet to be answered, primarily on the subjects of modding and multiplayer. While lead designer Ed Beach hinted in the livestream that the game will have modding support, we don’t know what the tools will look like, how full-featured it will be, or even if the game will ship mod-capable. As for multiplayer, some code divers claim to have discovered hints of multiplayer support in the media build, but Firaxis has been silent on the subject. Other unanswered questions involve what game setup options and scenarios (if any) Civ VI will ship with. Civilization VI will come in three flavors: the standard edition ($59.99 US), the Digital Deluxe edition ($79.99 US for the game, soundtrack, and 4 subsequent DLC), and the physical-only 25th Anniversary edition ($89.99 US for the Digital Deluxe items plus artbook, coin set, and display). In addition, pre-ordering any edition gets you access to the Aztec civilization led by Montezuma, which will unlock for free 90 days after launch for everyone else. Details on the various editions can be found at the Civilization homepage. Civilization VI is a huge game, and it’s impossible to cover everything with much depth in just a few pages. I didn’t even get into Religious Combat (direct combat between units of opposing religions), limited-use workers, retooled resources, tougher barbarians, expanded espionage, or revamped happiness and city growth. If you’re hungry for more, check out the Civ homepage, the excellent Civ analyst webpage Well of Souls, the CivFanatics Forums, the Firaxis livestreams and videos, or the plethora of Let’s Plays on YouTube and Twitch. Thanks for reading and stay tuned for our full Civilization VI review! Space Sector Announces Project Space Sector! Nice write up guys. I’m using every ounce of willpower not to smash buy on a pre-order. I’m nearly certain it will be an excellent addition to the franchise but I’m going to take your advice and let it simmer before diving into it. This is a deep game and it’s going to take some time to balance it out and square up the AI. Also Firaxis isn’t usually known for quick turnaround times on major updates. Well, I bought a deluxe edition through greenmangaming for $63. I support your willpower and prudence, BitGamer! That’s still a lot of money to shell out for this game, though. I’ll end up buying it anyways, and don’t expect to get review copies and if we do, it will be one at best. thanks for the nice roundup of information. i’m also looking forward to the release, but i won’t buy it until i saw some reviews after the release. the disappointment about CIV:BE is there, so no preorder. I don’t mind the AI cheating, but that isn’t an excuse for making no effort at all. Firaxis seem to view the AI as some minor feature these days. Beyond Earth was an absolute joke, even on Apollo difficulty. The AI wouldn’t attack you until you are 2 turns from winning and it is too late to stop you. It doesn’t matter how interesting the new mechanics are, if the AI can’t pose any challenge at all. I agree that from what we’ve seen so far (media builds, Firaxis livestreams, and particularly yesterday’s AI Battle Royale), the AI looks likely to be the game’s biggest weakness by leagues. That the AI gets bonuses on every level from Warlord up points in that direction as well. Rest assured that no matter how it turns out, we’ll go into detail on the AI for the full review. Civ I and Civ II were all good at start while Civ III, Civ IV and V needed expansions to become real games. Still have open games to finish in Civ IV RI mod … therefore ill be able to wait until Civ VI gets some xmass discount and is a bit more polished. Anything on map size? Civ5 did a huge hit on how big the biggest maps were, with the return of city spam is big maps back too? The media build shipped with Tiny, Standard, and Large, so we can assume it will have all of those at least. Considering the game options were at least somewhat stripped down, it’s likely there will be more than just those three. Beyond that, or how many tiles per size, I don’t think we have any confirmation one way or another. Thank you; I’m glad you enjoyed it!